Catch the Vision... Experience the Power! Rev. 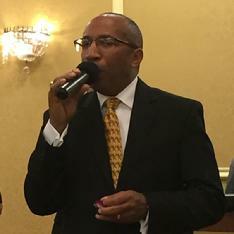 Dr. Bruce M. Williams is the founder and Senior Pastor of Upper Room Church in Edison, New Jersey, where he serves in ministry with his wife, Executive Pastor Phyllis A. Williams. Pastor Williams received Christ at an early age, answered the call and was licensed into the Gospel ministry in 1986 and as an Elder in 1988 by Bishop Donald Hilliard, Jr., Senior Pastor of the Cathedral International (formerly Second Baptist Church). As the Upper Room’s spiritual father, Pastor Williams faithfully preaches and teaches the Word of God and provides spiritual oversight to its members. Pastor Williams’ passion involves mentoring and developing Christians to live an abundant life of leadership and personal empowerment. He also shares his wisdom as the Director of the Ministers Training Institute and Leadership Training Institute, which provides leadership training to local church members and within the community. Pastor Williams founded the Berean Bible Institute, an extension of the vision of the church, to teach and train disciples with an emphasis on Christian apologetics. Pastor Williams previously served as the Presiding State Elder for the Eastern Atlantic Diocese of the Church of the Living God and as a member of the National Finance Committee of the Church of the Living God. Pastor Williams began his studies at the American University, Washington, D.C. He also attended Caldwell College and New Brunswick Theological Seminary. Pastor Williams received his Bachelor of Science in Theology at the Institute of Theology and Ministry Training in Orlando, FL, holds a Master’s Degree in Theology, and Doctorate of Theology from Christian Bible College and Seminary, Independence, Missouri. Pastor Williams has been honored on numerous occasions as an effective leader who has set a standard of excellence and service for others. He has been recognized by the New Jersey General Assembly; presented a Joint Legislative Resolution, and opened the Legislative Session in an inspiring and motivating prayer of invocation. Pastor Williams is loved dearly as a leader and mentor by his associates, staff, and family. He is the proud parent of five adult children; (Judge) Tiffany Williams, Bruce Jr., (Rev.) Jeffrey (wife Carolina), Michael, and Timothy (wife Brittney), granddad to Jeffrey Jr., Kian, Kellan, and Milani. To know Him is to love him. He is truly a man after God’s own heart.